Do you own a micro:bit or micro:bit Go Bundle and want to expand your skills with the new microcontroller? You are in luck! The SparkFun Inventor's Kit Bridge Pack for micro:bit was designed to provide you with an easy way to transform your m:b into a full fledged learning kit! Each Bridge Pack includes all of the parts found in the SIK for micro:bit that aren't included with the Go Bundle. With the SIK Bridge Pack for micro:bit you will be able to complete circuits that will teach you how to read sensors, move motors, build Bluetooth® devices and more. Note: The Bridge Pack is NOT a full SparkFun Inventor's Kit and only includes the parts to complement a micro:bit Go Bundle or standalone board. 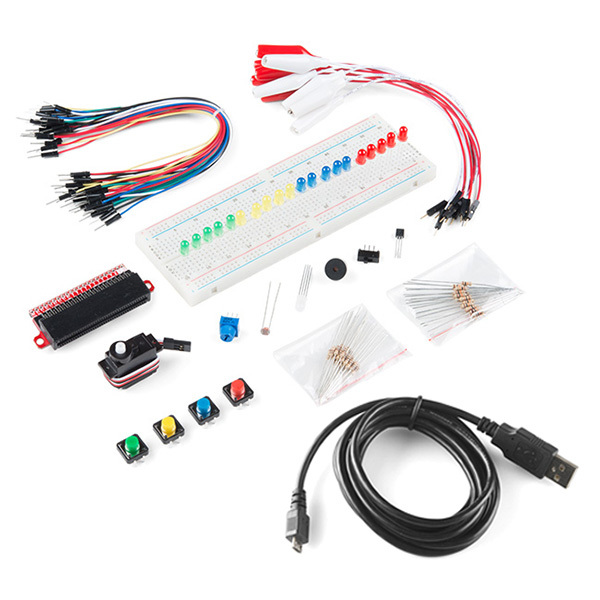 That also means that this kit does not include a micro:bit, which will need to be purchased separately.